The award by Statoil covers seven supply vessels at a total contract value of NOK 3.1 billion, including options. All vessels will be equipped with hybrid battery operation, and the possibility of shore power connection. “We look forward to a long-term cooperation with the chosen ship owners. The contracts will bring predictability to both the ship owners and Statoil, and will allow us to focus on optimising our operations to continuously improve operation, safety and energy efficiency,” says Philippe F. Mathieu, senior vice president for joint operations support in Statoil. The vessels chosen have good technical specifications adapted to Statoil’s logistics operations. The seven supply vessels will operate from the supply bases at Mongstad, Dusavik, Florø and Kristiansund. “The bidding process has attracted high attention, and we have received bids for around 50 vessels from many competent and highly qualified ship owners. We require the crew on all vessels to speak one of the Scandinavian languages,” says Mathieu. Four of the contracts have a duration of five years, plus five one-year extension options. Three of the contracts have a duration of three years, plus three one-year extension options. The following ship owners and vessels have been awarded 5-year contracts, including five 1-year extension options: Skansi Offshore (Sjoborg), DOF (Skandi Mongstad and Slamdo Flora), and Solstad Farstad (Far Searcher). The following ship owners and vessels have been awarded 3-year contracts, including three 1-year extension options: Ugland (Juanita) and Havila (Havila Foresight and Havila Charisma). 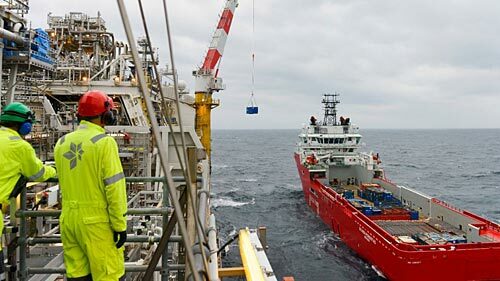 Including its current vessels, Statoil has 16 supply vessels on long-term contract with 10 different ship owners. Statoil will still need the spot market after these awards, but the need will vary from day to day. In addition, with an ambition of being a leading company in carbon-efficient oil and gas production, Statoil is focusing on reducing emissions from our logistics activities. Frida Eklöf Monstad is head of Statoil’s marine unit in the company’s logistics activities, and has with her colleagues, worked extensively with the ship owners to reduce fuel consumption and emissions. “Since 2011 we have reduced CO2 emissions from our vessel portfolio on the Norwegian continental shelf (NCS) by close to 30%, and together with the ship owners we want to further reduce our climate footprint. Vessels that can demonstrate low fuel consumption have therefore been successful in this award. Based on our experience battery operation has a good impact on consumption and emissions, and we are pleased that all vessels awarded long-term contracts with us today will be equipped for battery power and shore power,” says Monstad. None of the vessels awarded contracts currently have a system for battery-operation or shore power. This equipment will however be installed, and the NOx fund is a key support player and contributor to the ship owners in their effort of installing batteries. The vessels will have “Battery Power Notation”, which allow them to achieve great savings in fuel consumption while working in dynamic positioning alongside the installations. Statoil already has two battery-operated vessels on contract.